In a previous tutorial, The 72 ppi Web Resolution Myth, we looked at a belief held by many digital photographers and web designers today that images destined for the web or for viewing on-screen need to be saved in Photoshop at a resolution of 72 pixels per inch. Some believe it allows their images to display properly on the web. Others believe a 72 ppi resolution prevents people from downloading and printing high quality versions of the image. However, we learned in that tutorial that neither of these reasons hold true, and that 72 ppi hasn't actually been a useful "standard" in over 20 years! As we learned in that tutorial, computer displays today all have screen resolutions higher than 72 pixels per inch, and we proved it by learning an easy way to find your monitor's actual screen resolution. In this tutorial, we'll learn how to take that information, give it to Photoshop, and enjoy much more accurate on-screen previews of how our photos will look when printed! Version Requirements: To get the most from this tutorial, you'll need to be using Photoshop CS4 or higher and that's because we'll be using a feature that Adobe first introduced in CS4. It is not available in CS3 or earlier. I'll be using Photoshop CS6 here but any version from CS4 and up will do. Photoshop lets us view our images at just about any zoom size we like using the Zoom Tool, and it also includes a few automatic zoom options under the View menu in the Menu Bar, like Fit on Screen, which zooms the image to whatever size is needed for it to fit entirely within the dimensions of your display, and Actual Pixels which instantly jumps you to the 100% zoom level. Yet one zoom option under the View menu has remained a mystery to most Photoshop users over the years - Print Size. I'm calling it a "mystery" to be polite, but most Photoshop users simply call it "useless", a more accurate description. At least, it's accurate if you don't know the two important things we're about to learn - why it's useless and how to fix it! Like Apple's original 72 pixel-per-inch screen resolution standard from nearly 30 years ago, the goal of Photoshop's Print Size view mode was to give us an accurate preview of how the image on your screen will look when printed. The way it's supposed to work is that when we choose the Print Size command from the View menu, Photoshop instantly zooms the image to whatever level is needed for it to appear on your screen at the same size it will appear on paper. For example, if you're working on an image that will be printed as a 4x6, the Print Size command would display the image 4 inches x 6 inches on your screen. Not only would this help you visualize the final printed result, it would also help when sharpening the image for output. At least, that was the plan. Here's the problem. In order for the plan to work, Photoshop needs to know your computer display's screen resolution so it can do the math and figure out the correct zoom level, but Photoshop doesn't know your display's screen resolution and it has no way of finding that out on its own. So what does it do? It just assumes your screen resolution is that good ol' 72 pixels per inch nonsense when it's really much higher than that. What happens when we do the math using the wrong numbers? We get the wrong answer, and in the case of the Print Size view mode, Photoshop ends up choosing the wrong zoom level, resulting in a print size preview that's not even close to being accurate. An image open in Photoshop at 100% zoom. 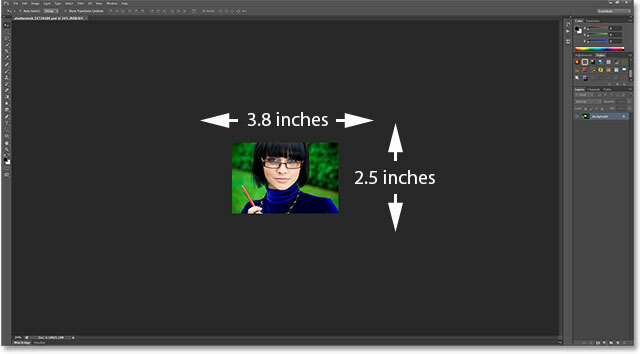 The Document Size section shows us the size the image will print based on its resolution. Going to View > Print Size. According to how the Print Size view mode is supposed to work, Photoshop should instantly jump to whatever zoom level is needed for the image to appear on my screen at the same size it will print, which in this case would be 6 inches across and 4 inches from top to bottom. 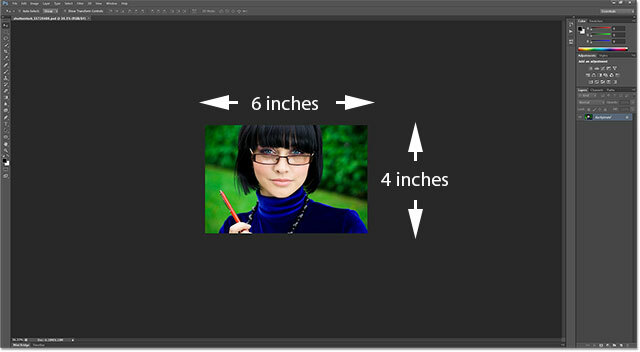 In other words, I should be able to grab an actual 4x6 photo, hold it up to my screen and see that the size of the image on my screen in Photoshop now matches the size of the photo. The image should be 6x4 inches on my screen. Something's not right. The current zoom level appears in the bottom left corner of the screen. How do we fix that? We find out what our computer display's actual screen resolution is and then we give that information to Photoshop. First, we need to find our screen resolution using a simple test. If you've already done this step from the previous tutorial and you have the information handy, you can skip this part and move on to the next step. 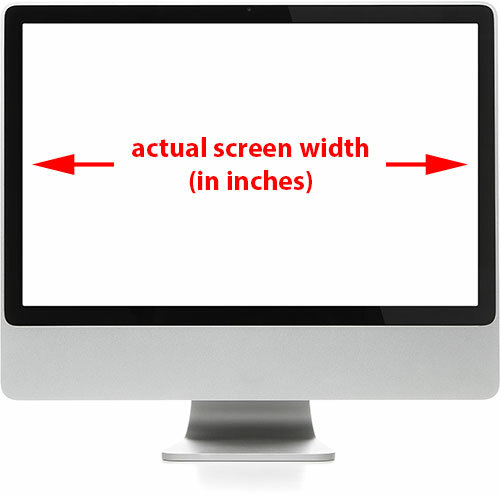 Measure the width of your screen (not including the outer border). Next, make sure your computer monitor is running at its native display resolution, which gives you the actual number of pixels in your display from left to right and top to bottom. For example, a screen with a native display resolution of 1920x1080 has 1920 pixels from left to right and 1080 from top to bottom. The monitor I'm using runs at 2560x1440. Whatever your monitor's native display resolution is, make sure it's what you have it set to in your operating system's display options. Then, simply take the first number in your monitor's native display resolution, which gives you the screen width in pixels, and divide it by your measured screen width in inches. This will give you the actual screen resolution in pixels per inch. For example, I'll take the first number in my display resolution, 2560, and divide it by my measured screen width in inches, which was 23.4. Using my operating system's handy built-in calculator, 2560 ÷ 23.4 = 109.4, which I'll round off to 109. So, using this easy test, I've quickly figured out that my display's screen resolution is 109 pixels per inch, not 72 pixels per inch like Photoshop had assumed. Again, your screen resolution may be different, but it will certainly be higher than 72 ppi. On a PC, the Preferences are under the Edit menu. On a Mac, they're under the Photoshop menu. 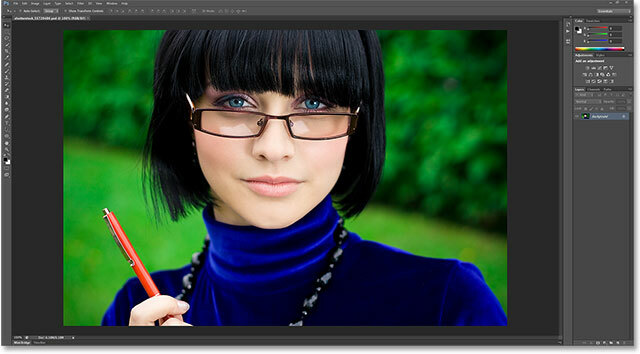 Photoshop's default Screen Resolution value is 72 pixels per inch. Enter your actual screen resolution. Make sure "Use Graphics Processor" (CS6) or "Enable OpenGL Drawing" (CS4/CS5) is checked. Going back to View > Print Size. The Print Size view mode now works more like it should. Photoshop chose the correct zoom level this time for an accurate print size preview. And there we have it! That's how to easily find your display's actual screen resolution (not 72 ppi), enter it into the Preferences, and get more accurate on-screen results from the Print Size view mode in Photoshop!